A famous trumpeter and former late night band show leader drops in as well as an acclaimed foreign ballet company, and a local art show that has sparked interest and gained “Momentum” takes over the Farmer’s Market this week. 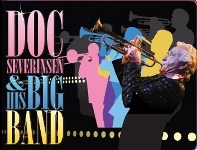 Doc Severinsen and His Big Band take the stage at the Armstrong Auditorium for a one-night-only performance in Edmond. Doc Severinsen has won several Grammy’s and was part of the band for The Tonight Show with Johnny Carson for 30 years, first as a trumpeter and later as Music Director. Now 84 years old, he is still known for his technical ability and sense of fashion. The band’s repertoire ranges from Count Basie and Duke Ellington to Broadway songs and Latin inspired jazz. The roughly month long tour the band is on now is the first tour Doc Severinsen has done in almost 5 years. The tour stops in Edmond March 8th. The Oklahoma Visual Arts Coalition presents its annual showcase from artists 30 and younger March 9th and 10th at the Farmer’s Public Market in Oklahoma City. “Momentum: Art Doesn’t Stand Still” welcomes all types of art spanning dimensions and media. Friday is referred to as “Momentum: Downtempo” featuring music from Jared Lekites, Colin Nance, and Ryan Lawson with the Hack & Saw Nation. Saturday is “Full Speed” with live entertainment by Tip Top Secrets, Student Film, Reality & The New Era. Three artists received “Momentum Spotlight” commissions and are displaying art created specifically for Momentum this year. Acclaimed Russian choreographer Yuri Grigorovich founded The Grigorovich Ballet Company in 1990. Nearly 100 of Russia’s premier dancers perform as part of the troupe. They display their talents at the Rose State Performing Arts Center in Midwest City from March 13th through the 17th. Over five days, the company performs three different shows: “Legends of Russian Ballet,” “Le Corsaire,” and “Spartacus.” “Spartacus” is a dramatization of the Roman slave who led a revolt against the government and was first choreographed by Grigorovich in 1968 during his time as the director of Bolshoi Ballet. There are also symposiums and educational opportunities in the next week across the metro. The Oklahoma Insurance Department and the National Weather Center have partnered to bring the first National Tornado Preparedness Summit to Oklahoma from March 11th through the 13th. Speakers for the summit include Governor Mary Fallin, Insurance Commissioner John D. Doak, and Jim Cantore from the Weather Channel. The Myriad Botanical Gardens presents the 2012 Oklahoma Gardening School March 10th at the Cox Convention Center. Speakers for the event include garden writers Ken Druse and Dr. Doug Tallamy, as well as OSU professor Michael Schnelle. Dr. James Fowler is a best-selling author and Guggenheim Fellow recipient. He is the keynote speaker at this year’s Emerson Wier Liberal Arts Symposium on March 14th. He speaks about social networking and its effect on human behavior in the Te Ata Auditorium on the University of Science and Arts of Oklahoma campus in Chickasha.